On February 22, the Begin-Sadat Center will hold an international conference, in English (with simultaneous Hebrew translation), on "Strategic Challenges in Saudi Arabia, Iran, and the Gulf," at Bar-Ilan University. The event is open to the public, free of charge. Click here for full program and details. Rafael Castro: Jewish Organizations and Populist Right-Wing Parties in Europe: Engage or Ostracize? Jewish Organizations and Populist Right-Wing Parties in Europe: Engage or Ostracize? EXECUTIVE SUMMARY: The Jewish world is divided on whether to engage or ostracize populist right-wing parties in Europe. The experience of Jews in the US and Poland suggests that a pragmatic approach would best serve the interests of both European Jews and Israel. 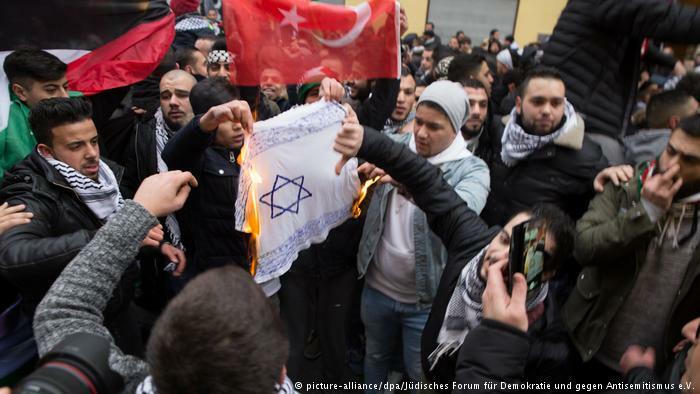 Muslims burn Israeli flag in Berlin, photo via picture-alliance-dpa-Judisches Forum fur Demokratie und gegen Antisemitismus e.V. EXECUTIVE SUMMARY: Photos of the burning of a homemade Israeli flag by Muslim demonstrators in Berlin in December 2017 drew international attention due to their association with images of Nazi book burnings in 1933. Senior German politicians have exposed widespread anti-Semitism among the country’s Muslims, a situation borne out by various studies. While measures have been announced against Muslim anti-Semitism, the most important action has not been proposed: to screen all those wanting to immigrate for anti-Semitic and anti-Israel attitudes and bar those found to hold such beliefs. Copyright © 2018 Begin-Sadat Center for Strategic Studies, All rights reserved. You are receiving this email because you are a member of our mailing list.